Hope you didn't spend too much time getting all that Resilience PvP gear. â€¢	Healers and hybrid-casters will benefit to a greater degree from PvP Power, and Battle Fatigue will increase to make PvP gear superior for healers. â€¢	Conquest gear will be increased to item level 496 (up from 493). â€¢	Elite gear will be decreased to item level 496. This gear will essentially become a prestige upgrade. The Big Change: We will be adding an item level ceiling to all gear in unrated Battlegrounds, Rated Battlegrounds and Arenas. â€¢	All gear with item levels higher than 496 will be scaled down to 496 (Conquest gear item level). This includes even Conquest items that exceed the level ceiling, such as weapons. â€¢	In patches that don't include a new season (including patch 5.3), the seasonal currency requirement of 7,250 Conquest Points earned will be lifted from weapons. The seasonal currency requirement must always be met to purchase Elite items, though. â€¢	Once the 27,000 Conquest Point seasonal currency requirement is reached, players will be able to purchase Tyrannical Gladiator's gear with Honor Points. â€¢	The Conquest Point catch up cap will be introduced. You can read our PvP Gear in 5.2 and Beyond blog for more information on these changes. "The competitive nature of PvP means that highly geared players can serve as a deterrent to players who are looking into trying PvP for the first time," says Blizzard. This change is all about increasing participation; now players' Resilience and Stamina boosts will be broadly the same, whether their gear is PvP or PvE, though weapon damage still favors PvP gear. 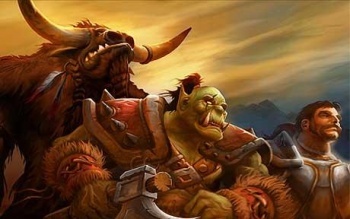 Increasing survivability, Blizzard hopes, will be enough of a carrot to tempt PvE geared players onto the battlefield. Only time will tell whether that tactic will be successful, but Blizzard's hoping that players will share their views on the subject.